As an only child, I am not much of a game player, unless that game is Solitaire. As a child, I always wanted to play exceeding long games of Monopoly with people who felt five hours of Boardwalk and Park Place was a huge waste of time. 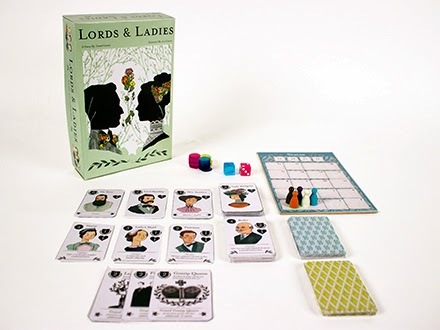 Recently, I ran across a wonderful new game, Lords and Ladies. It's like Monopoly with the cast of Downton Abbey. You build your house by acquiring status. You can make more money, hire servants, marry suitors, and procreate wisely. But beware. One's opponents can spread gossip and those servants might just conspire against you. The brother and sister team of Jason and Jen Corace came up with the idea. Like many entrepreneurs, they headed over to Kickstarter where the idea took off. Now you, too, can have your very own copy of Lords and Ladies. This might just hold you over until January, when Downton Abbey returns.